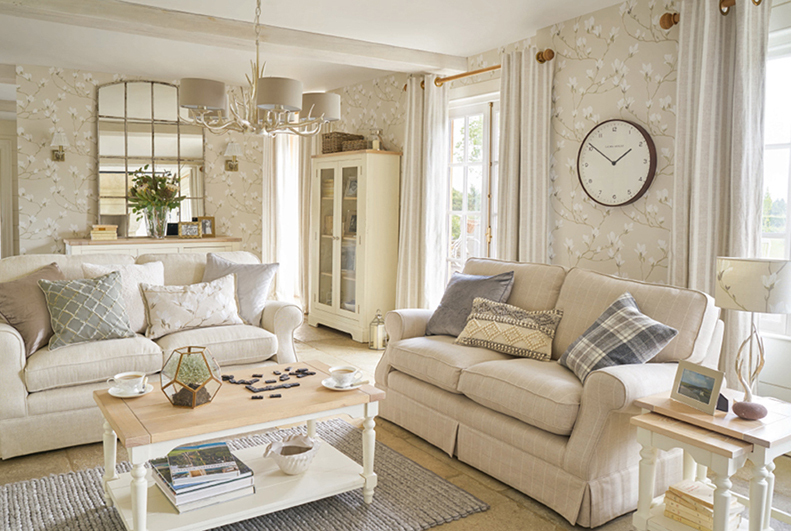 When it comes to wallpaper, you can pretty much find a design in every colour, style and pattern, which can make the idea of redecorating your home quite daunting. The amazing thing about today is there doesn’t seem to be an overriding trend, as we become more confident with our own tastes. Now, we are embracing schemes that work for us, making our house feel more like a home. Using our beautiful wallpapers and following this year’s interior guidelines, we hope that you will be inspired to find your perfect wonder walls. 2017 is truly the year for the bold – with the Pantone colour of the year being green, it’s time for you colour lovers to go wild. 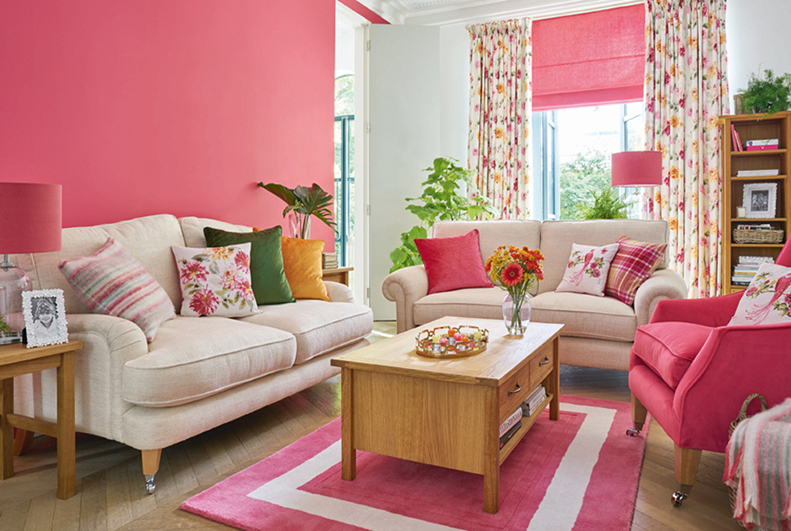 Pick a colour that is strong and vibrant to give your home that little extra something that brings it to life. 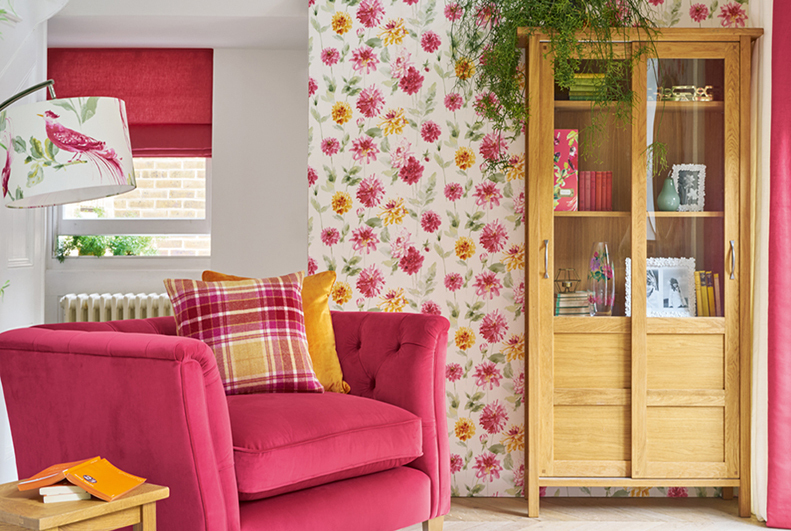 If decorating your room with one strong colour is a bit too much for you, then you can always opt for a wallpaper that features bold colours in it, such as our Dahlia Parade Pink Grapefruit Wallpaper. This vibrant pattern makes a multidimensional statement. Geometric wallpapers, in particular, are resonating with people wanting to create a bold yet fresh feel to their home. As statement walls, they work perfectly to anchor a room, but can also be a more subtle wallpaper when accented with eye catching decorations. 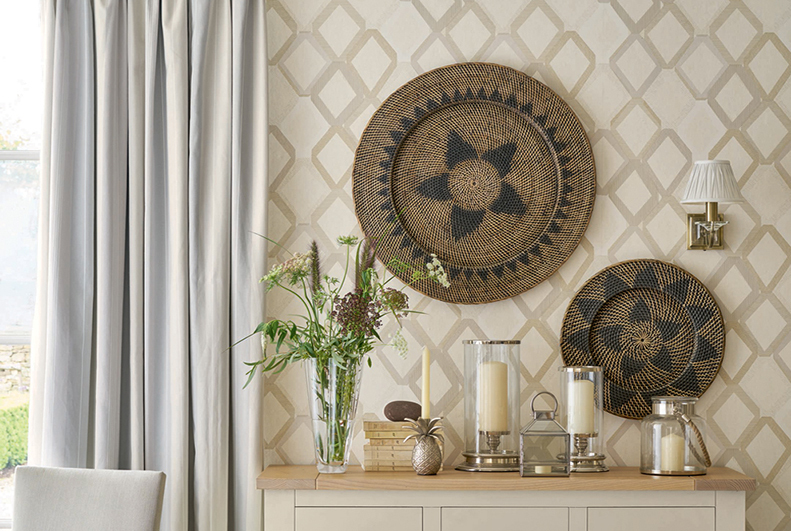 Our Weston Natural Wallpaper is the perfect example of this geometric shape that also has an organic feel to it. 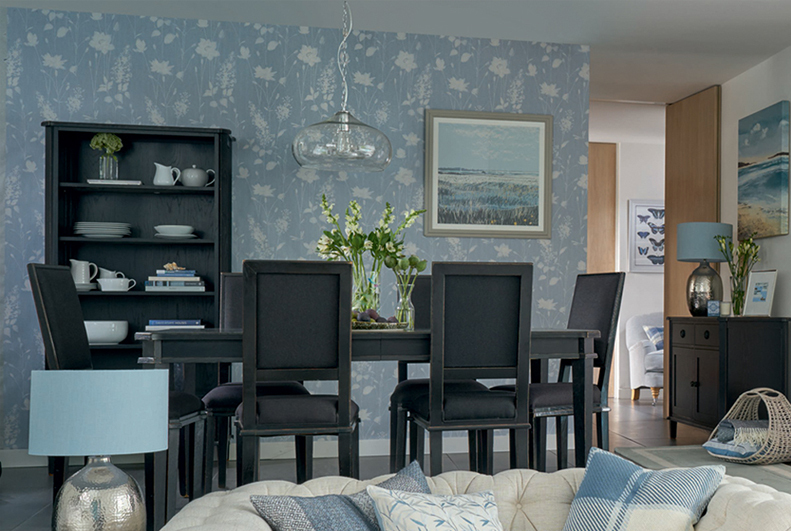 Inspired by the Nordic style of living, chalky tones of whites and blues seem to be a popular design in wallpaper this year. They speak to the beauty of imperfection and give your house a more natural and earthy feel. These soft, bright tones will be perfect for a little refresh to your home as we move into those summery days, as well as opening up your room, creating an illusion of a bigger space. Try out our Dragonfly Garden or Tongue and Grove Seaspray Wallpaper to create this effect. One of the biggest influences we have seen this year for interiors are designs that have botanical characteristics. Pick a design that has a summery feel to it, with new atypical flower and bird motifs. Our Magnolia Grove Natural Wallpaper will add a botanical vibe to any room you choose. 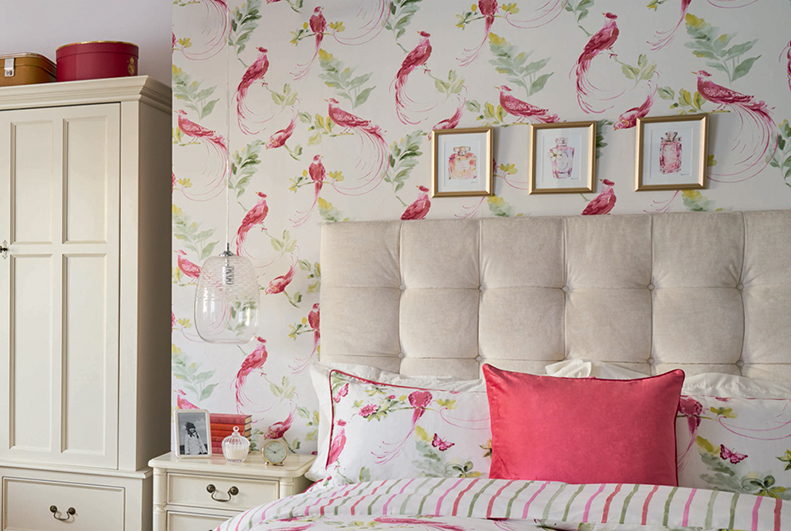 Our Harewood Pink Grapefruit Wallpaper is a unique twist on the traditional bird design with its bright, charming look. 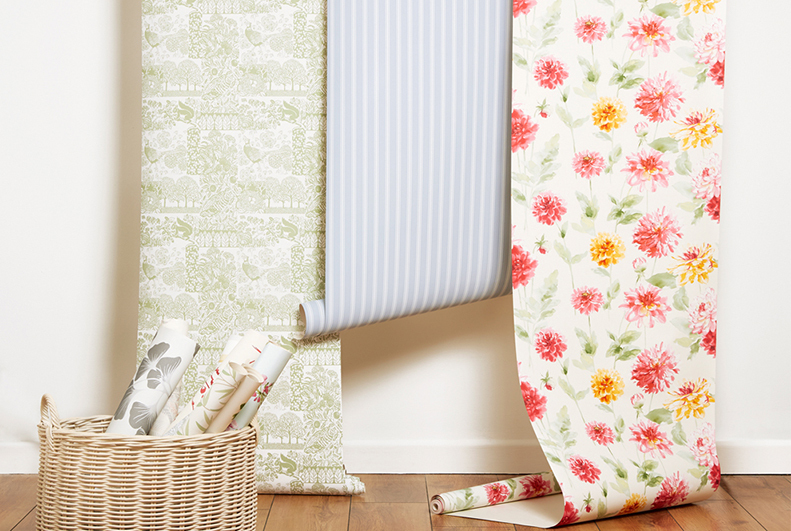 These inspired wallpapers will revitalize your home instantly and give that little extra character to suit your style. Following these interior guidelines, you can’t go wrong when it comes to creating your perfect wonder walls. Let us know what wallpapers you are crushing on this spring below or on Facebook. 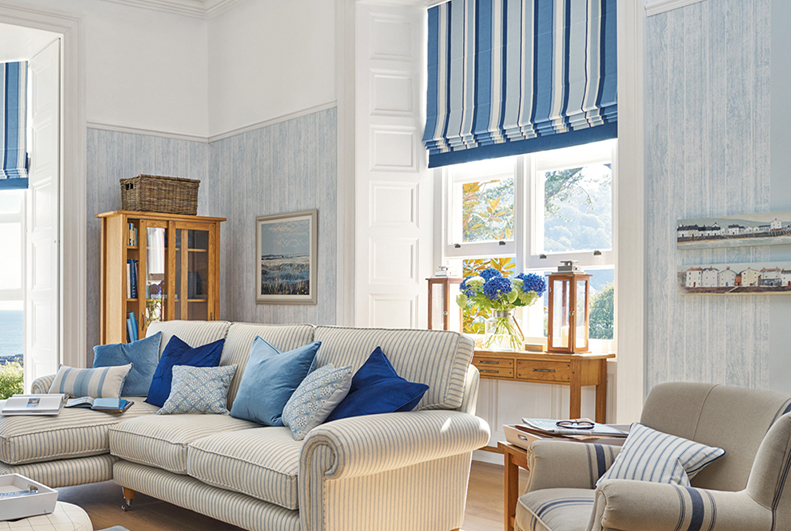 To view the full collection of products, visit our Home Collections page. This entry was posted in At Home, Favourite Posts, In Style and tagged bird wallpaper, blue wallpaper, botanical home, floral cushions, floral design, floral home, floral wallpaper, fuschia, natural wallpaper, new wallpaper, pink cushions, pink design, statement wallpaper, wallpaper. Bookmark the permalink.